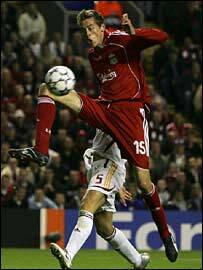 Peter Crouch's double led Liverpool to this Group C win but the 2005 winners were given a huge scare by Galatasaray. Liverpool were two up after 14 minutes thanks to Crouch's close-range volley and Luis Garcia's well-placed header. Early in the second half Crouch got his second, when with his back to goal, he scored with a wonderful scissors kick. But two headers from substitute Umit Karan ensured a tense finale as Galatasaray threatened to do what Liverpool had done to AC Milan in 2005. Liverpool went on to win that Istanbul final on penalties, but Galatasaray threatened to give Rafael Benitez's side a taste of their own medicine. Coming into this game Galatasaray had won only two of their last 19 Champions League away matches, but there was little sign of that indifferent away form as they mounted a remarkable comeback having gone three goals behind. Karan, who came on at the start of the second half, might have scored the goals for the visitors, but Galatasaray's most effective player was Sabri Sarioglu, who tormented Liverpool with some wonderful wing play. Before Karan got his goals, Sarioglu had hit the post with a dipping free-kick, though Liverpool also hit the woodwork when Dirk Kuyt hit a shot from the edge of the box. Crouch is proving to be a goal machine. Can Rafa afford to leave him out? From the rebound the Galatasaray goalkeeper Farid Mondragon defied Steven Gerrard from point-blank range when the Liverpool midfielder looked certain to score. Mondragaon had a fine game, but he was left hopelessly exposed by Orhan Ak for Crouch's first goal. The Liverpool striker brushed aside Ak to ruthlessly volley past Mondragon after Fabio Aurelio swung in an inviting cross from the left. Ak was also at fault for Liverpool's second. Cihan Haspolatl failed to clear a cross from Steve Finnan and when Ak had a second chance to get the ball away he was too easily dispossessed by Jermaine Pennant. The Liverpool winger lofted the ball up to Garcia, who powered a header past Mondragon. Having made such a poor start Galatasaray came out and began to give Liverpool problems, with Sarioglu the Turkish side's chief mischief maker. Even as Galatasaray carved out these openings their defence continued to creak alarmingly. Mondragon had to rush out to get to the ball first as Kuyt threatened, while the Galatasaray keeper was almost deceived by a Gerrard shot. Soon after the restart Galatasaray found themselves 3-0 down when Crouch connected so spectacularly with Finnan's cross from the right. That should have been the cue for Liverpool to improve their goal difference, but they had not reckoned with Galatasaray's resilience. Arda Turan provided the cross for Karan's first goal, with the iirrepressible Sarioglu serving up the delivery for the subsitute's second header. At that point Galatasaray still had another 25 minutes to find another goal, but having got two in six minutes they were unable to secure the equaliser, despite several goalmouth scrambles. Liverpool: Reina, Finnan, Carragher, Agger, Aurelio, Pennant (Sissoko 78), Alonso, Gerrard, Luis Garcia, Kuyt (Gonzalez 66), Crouch (Bellamy 90). Subs Not Used: Dudek, Hyypia, Riise, Zenden. Goals: Crouch 9, Luis Garcia 14, Crouch 52. Galatasaray: Mondragon, Haspolatli (Karan 45), Tomas, Song, Ak, Sarioglu, Topal (Sas 45), Akman, Turan (Carrusca 86), Ilic, Sukur. Subs Not Used: Elmas, Buruk, Asik, Kabze.